Oh, no, sorry, not that kind of bath! I meant a forest bath. Wait, you don’t know what a forest bath is? They’re short, slow, contemplative walks through the forest meant to help you appreciate things you can only experience when moving slowly. Sounds pretty nice, right? The practice of forest bathing was first developed in Japan in the 1980s. There they call it Shinrin-yoku, which translates to “taking in the forest atmosphere” or “forest bathing”. It works too. 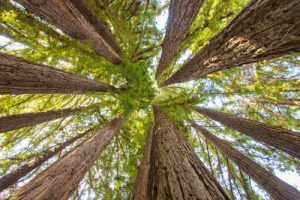 The physical and psychological benefits of forest bathing are pretty astounding. Scientists have found that taking a forest bath can lower your heart rate and blood pressure, decrease stress levels, elevate your mood, increase working memory and even bolster your immune system. That’s right – all just by taking a pleasant walk through the trees. What I found most interesting about forest bathing is the research conducted by Quing Li, a professor at the Nippon Medical School in Tokyo. He measured the activity of natural killer cells (blood cells that destroy other infected or cancerous cells) in the immune system before and after exposure to the forest. Li’s subjects showed significant increases in killer cells the week following their visit to the forest, bolstering their immunity. So, where did this boost in immunity come from? Li’s research suggests these increases in the killer cells come from an element called “phytoncide”. It’s basically an oil that trees and even some vegetables emit to protect themselves against bugs and insects. Li’s research suggests that breathing phytoncide is what increases the level of killer cells and improves immune system function. Turns out the fresh forest air doesn’t just smell good, it can give boost your immune system too. Ready for your bath now? 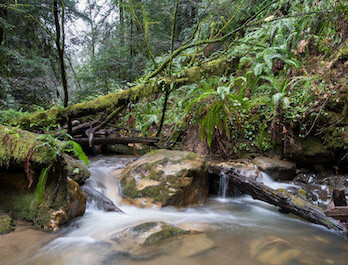 Meander through towering redwoods along a creek in a quiet forest. Find more info here. 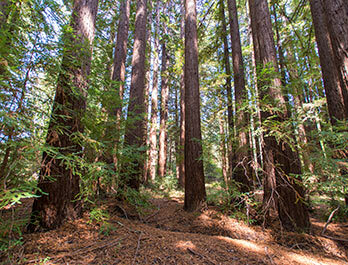 Enjoy a scenic path through redwood, oak, madrone and Douglas-fir trees. Find more information here. 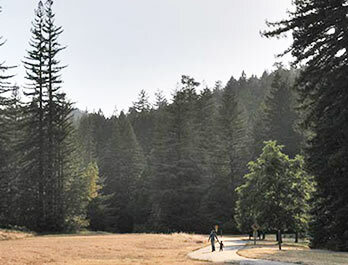 Go deep into the heart of redwood country and enjoy views from an old fire lookout. Find more information here.